After a frustrating first half, Neymar headed home Lionel Messi's cross to give Barca the lead. 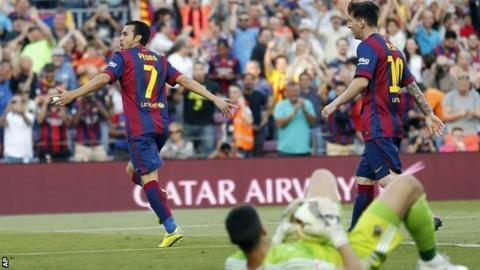 And substitute Pedro wrapped it up late on with a brilliant acrobatic effort from the penalty spot. This round of La Liga games is the last before a suspension of football in Spain starts in an argument over television rights. If a solution is found and the season can continue, Barcelona, who have now kept seven consecutive clean sheets, need only to beat champions Atletico Madrid or final-day opponents Deportivo La Coruna. In the reverse meeting in January, Moyes led La Real to a famous win but, with the club safely at mid-table, they had little to play for at the Nou Camp. Barca boss Luis Enrique made changes with Tuesday's Champions League semi-final second leg against Barcelona in mind, following their 3-0 first-leg success. Xavi, Adriano, Marc Bartra and Rafinha all came in but they still dominated from the start with Geronimo Rulli denying a Messi header and Luis Suarez heading wide. The Real keeper then denied Gerard Pique with a good save, with the defender putting the rebound wide with an overhead kick. Barcelona kept up the pressure in the second half, and finally led when Real defender Mikel Gonzalez headed Messi's right-wing cross towards Neymar, who converted from close range. The game was sealed when Pedro, only on the pitch for three minutes, scored a stunning overhead kick as a deflection looped in the air to him. Barca are chasing a treble, with a Copa del Rey final against Athletic Bilbao on Saturday, 30 May - subject to football remaining suspended in Spain. Match ends, Barcelona 2, Real Sociedad 0. Second Half ends, Barcelona 2, Real Sociedad 0. Attempt missed. Xabi Prieto (Real Sociedad) header from the right side of the box is close, but misses the top right corner. Assisted by Gonzalo Castro with a cross following a corner. Corner, Real Sociedad. Conceded by Adriano. Attempt saved. Alfred Finnbogason (Real Sociedad) left footed shot from the centre of the box is saved in the centre of the goal. Assisted by Gonzalo Castro. Offside, Real Sociedad. Markel Bergara tries a through ball, but Alfred Finnbogason is caught offside. Attempt missed. Lionel Messi (Barcelona) left footed shot from the centre of the box is close, but misses to the left. Assisted by Neymar following a fast break. Goal! Barcelona 2, Real Sociedad 0. Pedro (Barcelona) right footed shot from the centre of the box to the high centre of the goal. Assisted by Luis Suárez. Attempt saved. Lionel Messi (Barcelona) left footed shot from outside the box is saved in the bottom right corner. Assisted by Neymar. Substitution, Barcelona. Pedro replaces Rafinha. Attempt blocked. Rubén Pardo (Real Sociedad) right footed shot from outside the box is blocked. Assisted by Gonzalo Castro. Substitution, Real Sociedad. Alfred Finnbogason replaces Carlos Vela. Substitution, Barcelona. Andrés Iniesta replaces Xavi. Substitution, Real Sociedad. Gonzalo Castro replaces Sergio Canales. Offside, Barcelona. Xavi tries a through ball, but Luis Suárez is caught offside. Attempt blocked. Lionel Messi (Barcelona) left footed shot from the centre of the box is blocked. Assisted by Xavi with a headed pass. Offside, Real Sociedad. Esteban Granero tries a through ball, but Carlos Vela is caught offside. Attempt saved. Neymar (Barcelona) header from the centre of the box is saved in the centre of the goal. Assisted by Dani Alves with a cross. Foul by Markel Bergara (Real Sociedad). Corner, Barcelona. Conceded by Gerónimo Rulli. Substitution, Barcelona. Sergio Busquets replaces Marc Bartra. Offside, Real Sociedad. Esteban Granero tries a through ball, but Iñigo Martínez is caught offside. Carlos Martínez (Real Sociedad) wins a free kick on the right wing.